85 Commercial Real Estate and Properties in Sunshine Coast are listed in 8 categories. We have 131 Industrial Warehouses for Sale , 74 Retail Shops for Sale , 56 Offices for Sale , 53 Development Lands for Sale , 23 Hotels and Leisure for Sale and 5 Other Commercial Properties for Sale . Corner Site Retail In Mooloolaba $1,250,000 + GST (if appl.. This property represents an excellent opportunity to purchase a highly visible retail site in the heart of Mooloolaba. Located at the Southern end of the Mooloolaba Esplanade and opposite the Surf Club, the property is in the heart of this rapidly developing area. + 125sq m site (approx) on two titles allows the flexibility to be split into smaller tenancies + Highly visible corner location directly opposite a busy intersection + External seating area, suitable for outdoor dining / restaurant operation + Grease trap access + Cold room within the tenancy, in near new condition + Two Basement car parking / storage areas + Neighbouring tenancies include Sundaze swimwear, Acai Brothers Superfood Bar + The property is also available for lease Call or email Louisa Blennerhassett or Paul Butler to inspect the property or find out about other suitable options. Our team is strategically located in two offices across the Sunshine Coast region and is ready to handle your commercial, industrial and retail property needs today so call or email now. Emily Pendleton of Ray White Commercial North Coast Central is pleased to present 9/188 192 Alexandra Parade, Alexandra Headlands as a tenanted investment for sale via Private Treaty. The property is situated on the corner of Alexandra Parade and Mary Street with strong visibility in a well established commercial and residential precinct. The premises forms part of the 4 star Grand Palais beachfront resort in the regions key retail centre with the likes of the Alexandra Headlands Surf Club, Alex Beach Resort and number of eateries and fashion destinations. The property is located directly opposite the beach and boasts excellent signage opportunities and ample walk by/drive by traffic which is why the property has been home to the surf shop for over 12 years. Tenant: Alex Surf Shop Operational: Current owner has 12 years in this location, has been a surf shop since 1980's Lease Commencement: 1/3/2019 Lease Expiry: 1/3/2022 Option: 2 x 3 years Increases: Fixed 3% increases each year Current Net Rent: $60,000 per annum Outgoings: 100% paid by the tenant The property is for sale via Private Treaty for $950,000. There is no GST applicable to the sale as it will be sold as a going concern with the lease in place. For further information or to arrange an inspection please contact Exclusive Marketing Agent Emily Pendleton. Rare opportunity to secure a fully leased retail / cafe investment to a long term tenant located in this highly sought after and extremely busy Hastings Street food court location, right in the heart of all the action in Noosa. + 5 year and 11 month lease + Two further options of 5 years + Annual net rental of $93,011.76 plus GST + Annual increases at 4% with Market Review at option + 59sq m (approx) of retail / cafe space fronting onto a huge seating area + Additional 4sq m (approx) storage area on title + For Sale by Expressions of Interest, closing Thursday 2 May 2019 The property is ideally located in the Bay Village food court surrounded by a vibrant mix of food retailers including Acai Nation, Noosa Kebab, Noosa Juicer and Gelatissimo, as well as retail shops, beauty and health services, a nightclub and a two level car park with over 130 car spaces and ample toilet amenity. Call or email Matt Marenko or Louisa Blennerhassett to inspect the property or find out about other suitable options. Our team is strategically located in two offices across the Sunshine Coast region and is ready to handle your commercial, industrial and retail property needs today so call or email now. Your opportunity to own one of Hastings Street's only freeholds with National tenant, Peter Alexander. + 6 + 6 year lease, Gross rental $374,315 per annum + 123sq m (approx) site, centre street position and favoured northerly street aspect + The building is as new being fully rebuilt in 2016 to a very high standard + This property represents the absolute best of Hastings Street retail and will be a trophy property in any portfolio + Closing Friday 26 April 2019 Call or email Paul Butler or Paul Forrest to inspect the property. Our team is strategically located in two offices across the Sunshine Coast region and is ready to handle your commercial, industrial and retail property needs today so call or email now. Tenanted Investment - 7.2% Yield $320,000 + GST (if applic.. This is a rare opportunity to secure a strong tenanted investment with entry level price point in the bustling town of Eumundi. Recently leased, the tenant has been operating in their business for a number of years from another location and has recently relocated to Eumundi. + Proven tenant, new 3 year lease with two x three year options returning $23,256 net (approx) + Currently tenanted as a commercial kitchen with retail shopfront + 61sq m internal kitchen / cafe plus 40sq m enclosed external dining area (sizes approx) + Two basement car parks + As new commercial kitchen fit out, energy and water efficient design with top quality finishes + Fully air conditioned + CCTV installed Call or email Louisa Blennerhassett or Matt Marenko to inspect the property or find out about other suitable options. Our team is strategically located in two offices across the Sunshine Coast region and is ready to handle your commercial, industrial and retail property needs today so call or email now. 2 Memorial Avenue in the Noosa Hinterland town of Pomona is comprised of three separate buildings on one freehold title and provides the perfect blank canvas for a quality retail / restaurant / health business. The owner of this property is a motivated vendor and has instructed us to present all offers for sale. The region has seen strong growth and popularity of boutique venues and retail concepts. Pomona is well positioned to attract this style of operation at present. + 464sq m (approx) site with Village Mix Zoning allowing a wide range of potential uses of the site + 142sq m restaurant with kitchen, 70sq m original shed and 15sq m retail tenancy (sizes approx) + 32sq m (approx) courtyard at rear perfect for outdoor dining + Beautiful vaulted ceilings, light filled open restaurant / retail area + Would suit restaurant / cafe / microbrewery or mixed use wellness centre / facility + Liquor licensed Call or email Louisa Blennerhassett or Paul Butler to inspect the property or find out about other suitable options. Our team is strategically located in two offices across the Sunshine Coast region and is ready to handle your commercial, industrial and retail property needs today so call or email now. Emily Pendleton of Ray White Commercial Northern Corridor Group is pleased to present Lot 2, 30 Minchinton Street, Caloundra as a tenanted investment for sale via Private Treaty. The property is situated within a high profile, beautifully presented building with an arcade leading from Minchinton Street to Bulcock Street just footsteps from the beach. 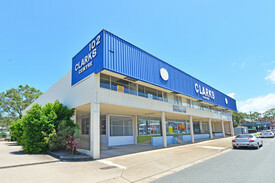 The premises forms part of the regions key retail centre and apartment building being the Centrepoint Arcade and the Centrepoint Apartments Caloundra. Tenant: Crumbz Cafe Operational: 4 years in this location Lease Commencement: 1/12/2016 Lease Expiry: 30/11/2021 Option: 1 x 5 years Increases: Fixed 4% increases each year Current Gross Rent: $33,745.92 Outgoings: Paid by Lessor ($9,080.35) Current Net Rent (after outgoings): $24,665.57 This property is being sold by the way of Private Treaty with Offers Over $350,000. For further information or to arrange an inspection please contact Exclusive Marketing Agent Emily Pendleton on 0402 435 446. Located in the Exeter Way Business Park in a modern complex of 12 units and packed with many features. Total floor area: 179m2 Warehouse: 107m2 Mezzanine Offices: 62m2 High clearance roller door access Tiled foyer and staircase to reception area Security alarm system, undercover car park Shower, ground floor kitchenette and toilet Upstairs kitchenette with stone bench and sink Built in storage, air conditioned offices and balcony For Sale: $395,000 + GST If Applicable For more information or to arrange an inspection please contact Marketing Agents: Len Greedy 0401 691 807 Len.greedy@raywhite.com Alan Gray 0414 894 084 Alan.gray@raywhite.com Approx. Jordan Hayes and Michael Shadforth of Ray White Commercial Northern Corridor Group are pleased to present this quaint little cafe to market. In a tightly held location, with direct frontage to one of the Sunshine Coast's busiest roads, this thriving cafe would suit a range of purchasers. The unit boasts an established tenant in place on a lease expiring July 2019 (options for a further 3 years) and rent of $20,540 + Outgoings + GST (if applicable) per annum. Feel free to contact the selling agents if this entry level investment property ticks the right boxes.